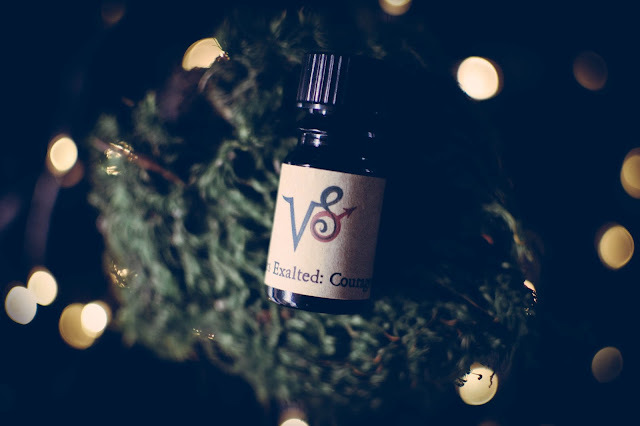 Nui Cobalt Designs is the purveyor of an exclusive line of Arcana Wildcraft perfumes that feature various astrological persuasions to reach a desired trait or feeling. I purchased mine based more on the scent notes rather than the magic behind the oil but if any influences are encountered I certainly wouldn't mind. It is not like a bought some that promised insatiable appetite for Oreos or paranoia that my neighbor is watching me workout, my eyes bulging, face red and mouth puffing out air like a bison running from a mountain lion, while said evil neighbor is pointing and laughing, clutching their own bellies. Wow that got really specific. Nope. I purchased Mars Exalted: Courage for $21.00. Mars Exalted: Courage- Notes: Crimson Dragon's Blood resin, smoked brown sugar accord, cinnamon, burning hemlock wood, black pepper and fiery red musk. In the bottle, Courage smells like a black shade of Dragon's Blood, deep, viscous and a touch sweet. Smeared on the skin, the Dragon's Blood opens up and releases a murmur of snug cinnamon that warms under the smoky influence of the burning hemlock. Earthy, spicy and smoky. As it dries, the earthy spice and smoke continue to enchant and an under current of red musk springs forth and adds a layer of strength to the Dragon's Blood but that smoked brown sugar accord keep the Dragon's claws from unsheathing and enfolds the scent in sweetness. I love this scent. It is Mother Earth with rumbling volcanoes surrounding her and a sweet kiss on her lips. Forest, the owner and proprietor of Nui Cobalt Designs is very kind and generous. She sent not only a sample of bath salts but also a hand written card. The bath salts smelled beautiful and made for a lovely bath. Nui Cobalt Designs also offers a Crone's Crate subscription box for those that may be interested. I already went back and picked up one more Arcana from Nui Cobalt Designs and can see myself popping back in for bath salts and other sundry items. Glad you liked Estella!!! I love it too. That deep dry down is so enchanting. She says it gets better with age too. I do miss Julia's soaps. They are so good. If she made matching body oils or lotions I would expire on the spot. Or bath salts! Or milk baths! Ok, now I am dreaming. Sometimes I hit a bunny trail and just go with it. Normally I would delete it and start over but hey. I was feeling risky. Maybe the perfume gave me courage.